The toric solenoids are the solenoids the central curve of which is a circle; therefore, they coil evenly around a torus. They can also be seen as the trajectory of a point with a uniform circular motion in a plane turning uniformly around an axis. The toric solenoids are also obtained as the intersection between the generalized Plücker's conoid: and the torus with center O and major and minor radii R and r. Opposite, the cases n = 2 and 3: the intersection is composed of several rotated solenoids. When the torus is reduced to a sphere (R = 0), we get the clelias. The projections on xOy are the conchoids of roses. When n is a rational number p/q, and R > r, the curve is closed and simple, and the knot associated to the corresponding toric solenoid is the torus knot T(p, q), that has p coils around the torus and q turns around the axis, and always is a prime knot. The knots T(p, q) and T(q, p) are equivalent (to go from (p,q) to (q,p), pass a needle in the bore of the torus). 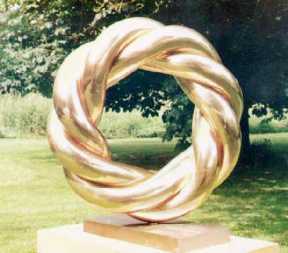 Every knot that has a representation without crossings on the torus is a torus knot of this type. Every right section of the tube has q blades and the view from above shows p (q – 1) crossings; it was proved that for p > q, this number of crossings is the minimal number of crossings of the corresponding knot, (the latter is therefore equal to q (p – 1) for p < q). 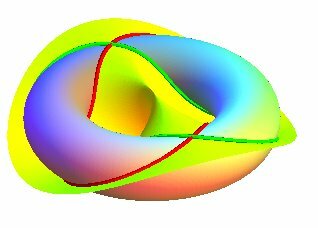 For n = 1 (and also for any n integer or reciprocal of an integer), we get the trivial knot (but contrary to what might be expected, the solenoid is not a Villarceau circle of the torus). T(2,3): we get the trefoil knot and not the figure-eight knot, contrary to appearances (for the figure-eight knot, the crossing on the left should be inverted). When p and q are not coprime, if we write d = gcd(p, q), p' = p/d, q' = q/d, n = p/q = p'/q', the toric solenoid of type (p', q') and its d – 1 images by consecutive rotations of angle around the axis of the torus form a link of d torus knots of type (p', q'), called torus link T(p, q). It is also a prime link with minimal number of crossings p (q – 1) for p > q (?). We can make the torus link T(p, q) by placing q blades of the same length side by side and applying a torsion of p/q turns and glueing the blades at their ends. The torus knots are also sometimes defined on the Clifford torus; their parametrization is much simpler: ; by identification of and , they can also be seen as the image of the unit circle by the map: . The torus knots and links for p > 2q are equivalent to the polygram knots and links. They are also the "edges" of the rotoidal prisms. The torus knot T(n, n–1) is equivalent to the n-leaved trefoil knot. Compare to the Turk's heads, that have the same view from above, but with alternate crossings. 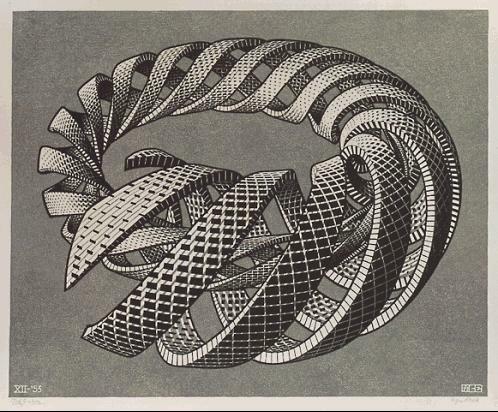 Also compare to the geodesics of the torus.